Though both of these errors are related to missing classes in the classpath, the main difference between them is their root cause. ClassNotFoundExcpetion comes when you try to load a class at runtime by using Class.forName() or loadClass() and requested class is not present in classpath for example when you try to load MySQL or Oracle driver class and their JAR is not available, while in case of NoClassDefFoundError requested class was present at compile time but not available at runtime. Sometimes due to an exception during class initialization e.g. 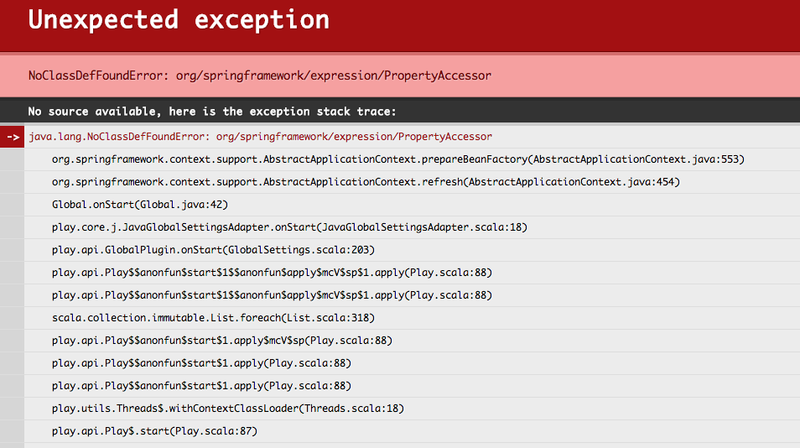 exception from static block causes NoClassDefFoundError when a failed-to-load class was later referenced by the runtime. From last few weeks I have been facing a cluster of ClassNotFoundException and NoClassDefFoundError while setting up a new project in Java. This new Java project has lots of dependency on various jars and some of the jar even contains the same name of file which makes my problem even more problematic. While working with NoClassDefFoundError and ClassNotFoundException I thought to document my experience and I have already shared some on 3 ways to resolve NoClassDefFoundError in Java and how to resolve ClassNotFoundException in Java. in this article though focus will be on similarity and differences between java.lang.ClassNotFoundException and java.lang.NoClassDefFoundError in Java. 1) Both NoClassDefFoundError and ClassNotFoundException are related to unavailability of a class at run-time. 2) Both ClassNotFoundException and NoClassDefFoundError are related to Java classpath. 1) ClassNotFoundException comes in java if we try to load a class at run-time using with Class.forName() or ClassLoader.loadClass() or ClassLoader.findSystemClass() method and requested class is not available in Java. the most of the time it looks like that we have the class in classpath but eventually it turns out to be issue related to classpath and application may not be using classpath what we think it was using e.g. classpath defined in jar's manifest file will take precedence over CLASSPATH or -cp option, for more details see How Classpath works in Java. On the other hand NoClassDefFoundError is little different than ClassNotFoundException, in this case culprit class was present during compile time and let's application to compile successfully and linked successfully but not available during run-time due to various reason. 2) ClassNotFoundException is a checked Exception derived directly from java.lang.Exception class and you need to provide explicit handling for it while NoClassDefFoundError is an Error derived from LinkageError. 3) If you are using ClassLoader in Java and have two class loaders then if a ClassLoader tries to access a class which is loaded by another classloader will result in ClassNoFoundException. 4) ClassNotFoundException comes up when there is an explicit loading of class is involved by providing name of class at runtime using ClassLoader.loadClass(), Class.forName(), while NoClassDefFoundError is a result of implicit loading of class because of a method call from that class or any variable access. Please let us know if you are aware of any other difference between NoClassDefFoundError and ClassNotFoundException in Java , I would be happy to incorporate those. I am encountering a weird situation. How is this possible, Class.forName for both DataValidationMessage and ValidationMessage works, clearly they are recognized by the classloader So what could be the issue. hi Anonymous, I will write when I have a good topic to wrote about electronic trading system, currently I have written about FIX Protocol and you can check that. Good differences. I agree that both NoclassDefFoundError and ClassNotFoundException shares some natural similarity which doesn't exist and create confusion on java programmer's mind. 􀂃 The forName(..) method in class - Class. 􀂃 The findSystemClass(..) method in class - ClassLoader. 􀂃 The loadClass(..) method in class - ClassLoader. ClassNotFoundException means compiler not able to find specified .class file. NoClassDefFoundError means compile not able to load .class file. Both can happen because of wrong classpath set. Thanks for providing such useful information...its working. Isn't this statement "Both ClassNotFoundException and NoClassDefFoundError are related to java classpath." wrong? For e.g. if you try Class.forName by passing wrong name you get ClassNotFoundException and that nothing to do with classpath. It didnt throw any error or exception.